It was announced at the D23 Expo in Anaheim this past summer that a new Star Wars hotel will be added to the Walt Disney World Resort. Today, as part of the D23 Expo in Japan, we have a few more details of what Guests will be able to expect when the hotel officially opens. First, as suspected, the hotel will be seamlessly connected to Star Wars: Galaxy’s Edge at Disney’s Hollywood Studios. This resort will be a first of its kind and will completely immerse Guests into the Star Wars story. 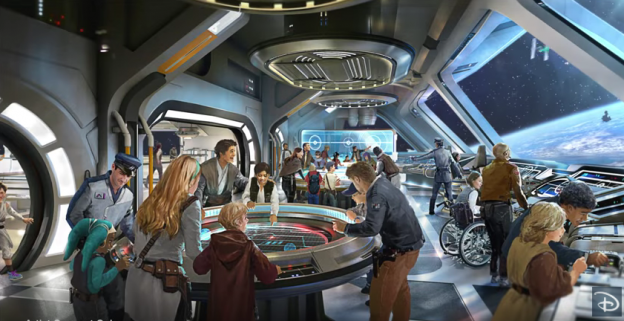 The Guests’ journey through space will start when everyone departs together for a multiday Stars Wars adventure by boarding a starship. Guests will experience characters and stories that unfold all around them during a voyage through the galaxy. At the resort, Guests will immediately become active citizens of the galaxy and will have the opportunity to dress up in proper attire. In addition, every window of the resort will also have a view into space. This will be a luxury resort that meets adventure in a galaxy far, far away.